San Pietro di Castello (San Piero de Casteo, in dialect) was Venice’s cathedral from the 11th century until 1807, when the rationally minded Napoleon made the ducal chapel of San Marco the seat of Venice’s Patriarch. Its lonely, distant site is no small comment on the Republic’s hostile attitude towards the Papacy. In practice the Venetians were (and still are) more church-going than the Romans, but when it came to popes trying to assert any degree of temporal authority, the Venetians firmly drew the line. Their Patriarch, a position assumed in 1451 from the ancient see of Aquileia, Grado and Udine, with the same status as a cardinal, was appointed by the Venetian Senate instead of the Pope; and whenever a church problem was discussed by the Senate it was always noted at the head of the official minutes: ‘Cazzadi i papalisti’ (‘The supporters of the Pope have been removed’). Retired from its cathedral status, San Pietro is as relaxed as any pensioner could be, set in a pretty grassy campo, nursed by a pretty if precariously tipsy campanile in shiny white Istrian stone (the only stone one finds in Venice) built by Mauro Codussi; neighbourhood ladies pull up their deckchairs and knit in its shadow. The first church on this site was last replaced in 1550-1621 by a white and spacious design, begun by Palladio but mostly the work of his close followers, Franesco Smeraldi and Girolamo Grapiglia. 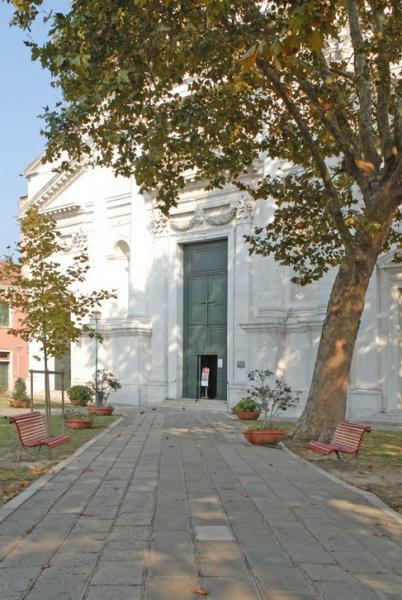 After damage from a firebomb in the First World War, it was a sad sight until the 1970s, when it was restored by a Los Angeles committee of Save Venice; but to compensate for all its former indignities, it's now a World Heritage Site. As fitting for a former Cathedral, it has its share of art in its airy, luminous Latin cross interior. In the right aisle there’s a marble throne with a figure eight-shaped back, two Stars of David and an inscription from the Koran—all part of a 13th-century Muslim tombstone. The belief that this was St Peter’s throne from Antioch (note the old inscription above it) probably grew up when some shrewd prankster sold it to an ignorant crusader. The marble-inlaid high altar was built to an elegant design by Baldassare Longhena, to enshrine relics of St Lorenzo Giustiniani – Venice’s first saintly patriarch (d. 1456) and the one consecrated body the Venetians didn’t have to steal. Most essentially for the Venetians, St Lorenzo had some influence in Heaven during plagues, as can be seen in the painting on the right wall; it was his intercession in 1630 that earned him the fancy altar, ordered by the Senate, even though he wasn’t canonized (by Rome, that is) until 1690. Also look for the Plague of serpents (1660) by Pietro Liberi, one of his finest works. Longhena also designed the Vendramin chapel with its Madonna, Child and Souls in Purgatory (1650) by Luca Giordano. Most compelling of all is the little Cappella Lando in the left aisle, the only survivor of the earlier Gothic church, with a 5th-century Roman mosaic fragment of a vase of flowers, a marble pluteus, stylized Byzantine-Veneto capitals on the columns, and a bust of Lorenzo Giustiniani, whose sunken cheeks, tight lips and lines of care betray him as a true son of Venice. Just outside of the chapel is a late (1581), recently restored painting by Veronese, SS John the Evangelist, Peter and Paul. The former patriarchal palace is to the right of the church, along with a piquantly picturesque cloister, converted in 1807 into a barracks; today it's used as public housing. Of all Venice's art churches, it's the one with the most active group of parishoners, who hold several events during the year for the locals, as well as the biggest and most popular neighbourhood festa in late June, culminating on St Peter's Feast Day on the 29th. San Pietro is a Chorus church.